We have a close cooperation. Our operations staff is in frequent contact with itelligence, whose core competence is SAP Basis. We have used them since 2009 and they know us very well. We have a strong 24/7 service agreement on SAP operation and we wish to maintain this model. We don’t want to establish this in-depth core competence in our own organization - it’s more flexible to purchase it from itelligence as a variable cost. Headquartered in Denmark, Cheminova produces chemical products for plant protection and agricultural solutions and has more than 2,000 employees globally. hours a day is crucial for the company. 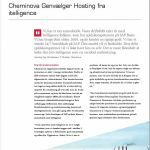 Headquartered in Denmark, Cheminova produces chemical products for plant protection and has taken a wide range of steps to secure operations and uptime.